I started talking to ghost when I was getting my MFA at Goddard College. If you know about Goddard, you might have heard that its haunted. Not by just by one, but several ghosts. Or so the stories go. But I have proof. The campus is nestled in a tiny town in rural Vermont, called Plainfield, and is comprised of various eclectic buildings that reflect its inclusive and progressive atmosphere. It’s nothing fancy, but it felt like home while I was there for four weeks in-residence during my two-year master’s education. Even with the ghosts. You see, after spending my childhood and much of my early adult years trying to firmly deny their presence, I had started warming to the idea that spirits can, and do sometimes, haunt Earth after they leave their bodies. I even decided I might like to meet a few. As my friends and I gathered in the Manor house, one of the oldest buildings on campus, for an evening seminar that first semester, I couldn’t help glancing over at the piano to see if it would start playing. I had just been told by a fellow writer about the young mother and her daughter who sometimes drifted in to play a few keys. I stared frequently at that piano, but to my dismay, no specter made its presence at the bench. Later that night, though, an unwelcome visitor entered my room. I was sleeping in one of the dorms that wasn’t supposed to be haunted. Everyone knew there was a ghost in the faculty dorm, one of my advisors even confessed to our class that it had chased her outside one night. I thought I was fine, alone in my single-room, even though it took me a long time to close my eyes, and when I did, they kept fluttering open to watch shadows play across the walls. “You’re fine,” I told myself. “Get a grip and get some sleep.” And I did, for about two hours before I was pulled, quite literally, out of a dream I can no longer remember. My arms instinctively rose to the back of my head, where I could still feel hands gripping my hair. I thought about keeping it to myself, but the next morning at breakfast, my friends and I started talking about the rumored ghosts again. We had plans to visit the manor house that night, where we had also been told heavy furniture, like file cabinets, moved across the floors late and blocked entry, and exit. So, in the midst of making our plans, I made my confession. I read the look of doubt on my companions’ faces, and realized I’d probably feel the same way. Sure we liked the idea of the ghosts, but none of us were entirely convinced by the stories we’d heard. Everyone wanted their own proof, and no one had witnessed mine. Hours later, and back at the dorm to gather books, I heard my friends Jane and Pam talking through my open door. “Come down,” Jane yelled up. “We’ve got something to tell you.” After I descended the stairs, she told me about the “hair-puller.” The maintenance man who had just fixed their phone had shared his knowledge about the Goddard ghost after Jane and Pam had casually inquired, without mentioning what had happened to me. My midnight visitor, it seems, was rather well-known. That was my last semester without a roommate. Thankfully the hair-puller did not return to my room, but I did manage the make the acquaintance of one of the manor house ghosts after Pam bought me my first pendulum. “I thought you might like this,” she said with a smile one day during our first residence, handing me the conical stone hanging from a chain. And so, Jane, Pam, my soon-to-be roommate Heather, and another friend Laura, and I became the Goddard Ghostbusters. Late at night we’d sneak out of the dorm, even though we were all well past the age of adolescence, to investigate the campus. We did our research and visited all the places that held legends of specters. I was armed not only with my pendulum, but with my camera. The camera was for recording evidence. And if you believe in spirit orbs, I caught plenty. In the garden shed, which we found unlocked one night, the five of us stood shivering with presence, as we gazed at the heavy beam that supported the structure. I clicked the camera several times at the place that felt troubled. “I wonder if that’s where the body was hanged?” I said as I shivered. The beam, you see, had been recovered from an old barn that had, rumor has it, experienced a hanging by suicide. I didn’t want to talk to that ghost. I only wanted, truthfully, to get out. Instead, the manor house became our chosen gathering place. Here we’d gather in different rooms, to explore and investigate. One night, Pam urged me to take out the pendulum to call in a ghost. She showed me how to hold the stone from its chain, and as it hung from my fingers, I felt a wave of energy pass into my arm. Suddenly I knew we weren’t alone. With the aid of the pendulum, we met the farmer that used to own the land where the buildings of Goddard now sit. From what we could tell, he seemed confused and sad. Had I known what I know now, I might have been able to help him. When we asked, he told us he wanted to leave, but didn’t know how. Subscribe to Althea’s newsletter here. Alethea Kehas is a writer and the owner of Inner Truth Healing. She recently published her first book, a memoir called A Girl Named Truth, an excerpt of which was featured on this blog in March of 2017. Her book is available on amazon.com and amazon.co.uk. Some mystics believe we choose our name, along with our life’s lessons, before we are born. The name we select becomes our constant guide, helping us to navigate the journey ahead. 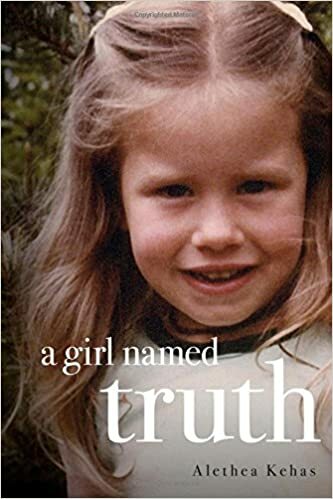 In her memoir, A Girl Named Truth, Alethea explores the subjective nature of truth while she untangles the uncomfortable wrap of narratives she was raised on. Her name serves as her beacon, guiding her to heal and find the inner voice of her own truth. The author’s story begins with her formative years, when her mother left her father and went into hiding with the Hare Krishnas. Months later, the young Alethea finds herself living 3,000 miles away from her extended family, trying to love a new father and forget the one she has left behind. Only she never forgets… A Girl Named Truth is a story of loss, love and the redemptive power of awakening a silenced voice. This entry was posted in Elusive realities and tagged A Girl Named Truth, campus, College, ghostbusting, ghosts, orbs, pendulum, suicide. Bookmark the permalink. Fascinating stories. I would not have liked to meet the hair puller! The Goddard Ghostbusters makes me think of a group near where I live which goes by the name of Mostly Ghostly. They started out investigating places reputed to be haunted though nowadays they tend to focus more on local history tours. I loved reading about the hair-puller, but I’m glad my specter just took me soaring around the room. I was rather envious of your flight journeys. Sounds marvelous! I’d love to do it one more time! I bet! When I fly in my dreams I always wake up with the disappointment of gravity.